This easy lamb apple breakfast sausage is perfect for breakfast or any meal of the day! It is savory and spicy with a hint of sweetness as the apples and spices compliment the lamb to pack a hearty flavor punch! This sausage is versatile as a main dish that serves well with eggs and toast, can be formed into meatballs to accompany pasta or vegetables and can stand alone as a low-carb and keto friendly meal. This sausage can also be the perfect appetizer to pair with hummus or any yogurt or sour cream based dip! Who needs store bought sausage when you can go all in at home and have a superior product that store bought sausage? The idea for this sausage came about when my sister Terra mentioned the sausage logs from Smart & Final that my mother used to buy and serve to us as kids decades ago. We ate a lot of it. I’m sure my mother thought it was an easy and affordable breakfast staple that you buy, cut frozen and pan fry! Done! I liked the sausage for the simple fact that it was sage heavy for my young palatte –albeit likely from artificial flavorings. Terra didn’t think so much of it because she could taste plastic flavor from the packaging that seeped through into the meat. YUCK! Although I don’t recall the plastic flavor in the meat myself, these days I am trying my best to steer clear of eating out of plastics and other packaging that contains toxins and harmful chemicals. That being said, sourcing clean meats (and other ingredients) is key! For this sausage recipe I recommend U.S. Wellness Meats ground lamb. Combine salt, pepper, cumin, paprika, sage, in a small bowl and set aside. Place lamb in a medium bowl and add spice mixture and mix well with your hands assuring that spices are well distributed throughout the meat. Add dijon mustard, fresh garlic, parsley and chopped apple to meat mixture and combine well. Allow sausage to chill in the refrigerator for 2-24 hours to allow flavors to blend. 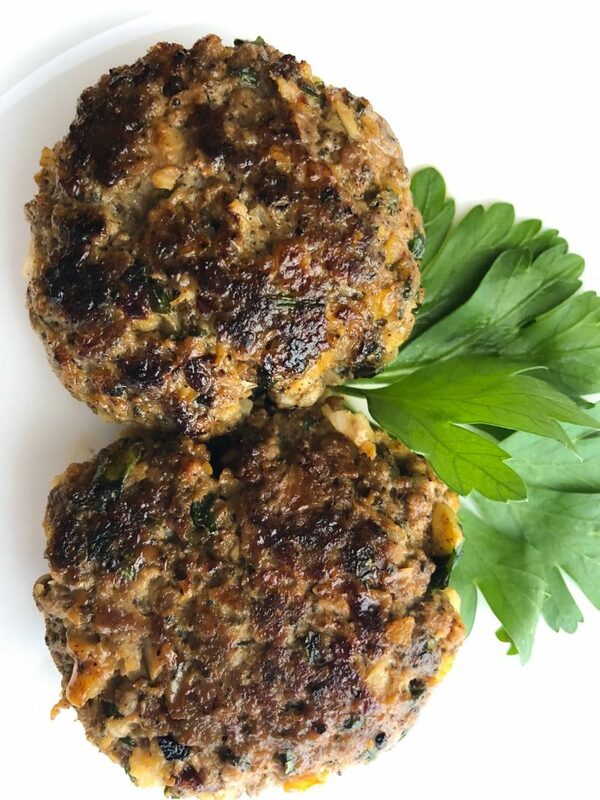 When ready to cook allow lamb to come to room temperature for 30 minutes, then divide lamb in to 4 portions and formulate patties using your hands. Heat cast iron skillet over medium heat and add canola oil. Place sausage patties in skillet and pan fry for 6-7 minutes on each side until internal temperature registers 160 degrees. Allow cooked sausage patties to rest for 3 minutes before eating. The sausage can be refrigerated for up to a week or formed into patties, wrapped individually in plastic wrap or wax paper, placed in a larger zip lock freezer bag and frozen for up to 3 months. Ground lamb can be substituted for ground turkey, chicken, beef or pork. I haven’t tackled making my own sausage before but this looks doable–thanks! This looks bomb and I could eat this in every meal!!! Cant wait to try! !